Opis teme: Sve što trebate znati o novostima vezanim za developere, prvenstveno .NET platforme. Na predavanju će biti riječi o novinama u samom WIndows 8, WinRT kao novoj platformi sa starim programiskim jezicima C# i XAML. Developer platforma na Windows 8 donosi novi koncept razvoja desktop aplikacija tzv. Metro aplikacija koje se vrte na WinRT, i koje zahtjevaju da vaša aplikacija mora biti kompatibilna sa dizajnom, u tom smislu definiše se pojam “compatible by design”, skupu principa i novih mogućnosti u Windows 8 za buduće desktop aplikacije. Želite više saznati o tome na koji način razvijati višeplatformske aplikacije koje se vrte na Win RT, WP7 i u .NET okruženju, a sve su bazirane na Metro Stilu sa certifikacijom za Windows Store. Biće prikazano i nekoliko demo primjera sa novimana koje se pojavljuju u novoj verziji C# 5, Async programming pattern i CallerMemberName. After announcing the new version of GPdotNET v2.0 in February of this year, today the post will announce optimization tool as a new part of the GPdotNET. When you make model there is often need to optimize it in order to get the specific input parameters for maximize or minimize output value. This is the case in most engineering process. For example if you model some process on CNC machine and you need to find which parameters of the process produces the best result. So every model calculated by the GPdotNET will be able to be optimized by optimization tool ff the GPdotNET v2.0. In addition with GPdotNET it will be possible to find global maximum or minimum of the function defined in analytic term as well. The picture below shows analytic tool definition. 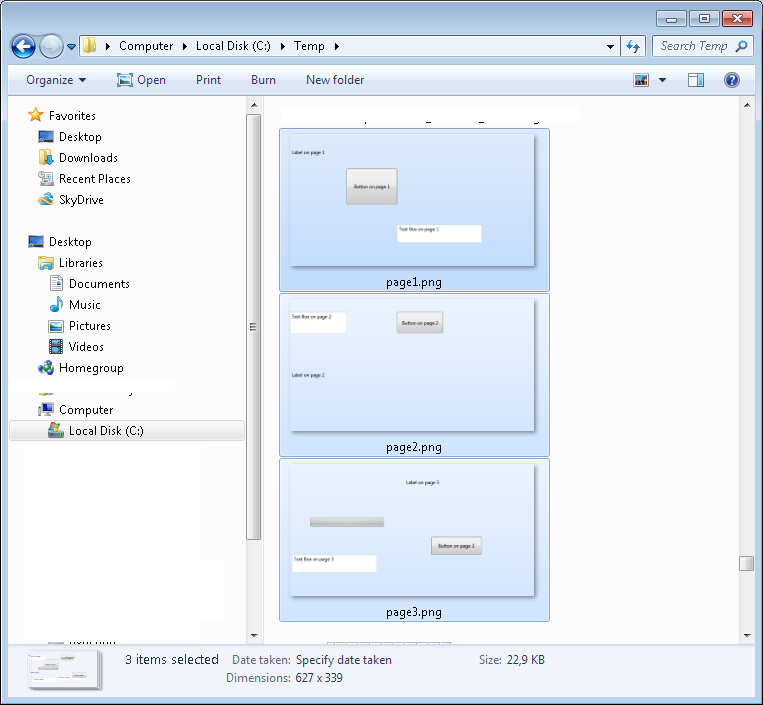 You can also see a brand new GUI for the GPdotNET v2.0. 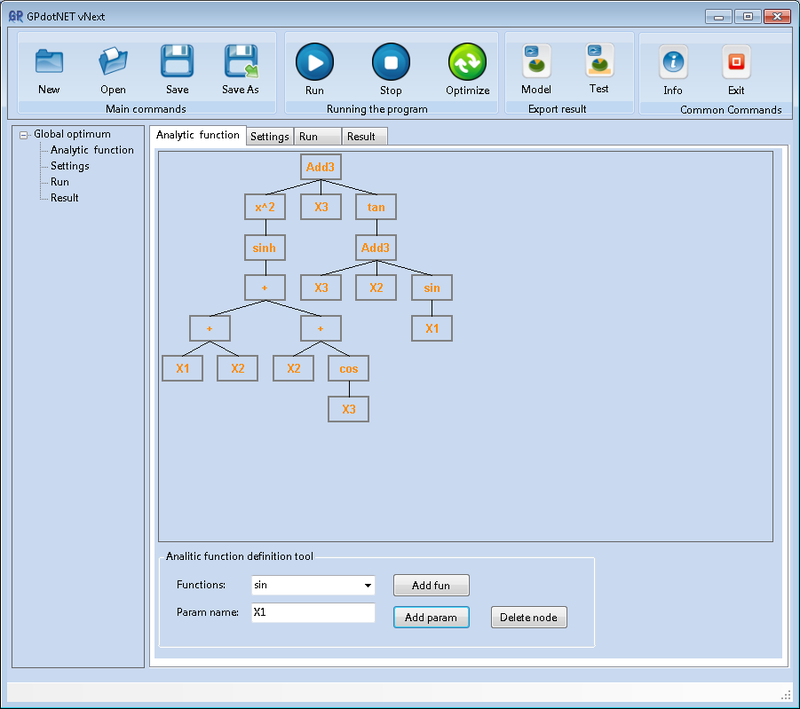 Within GroupBox you can see several buttons and combobox for selection basic math function. For example if you select SIN function from the combo box and click on Add function button, in the central window two rectangles will appear similar like this . The picture represents sin function with one argument. O argument means that it is not defined yet, and you will not go further until you specified the name of the argument, or define a another function in chain. The tool automatically knows how many arguments need every defined function in GPdotNET. If you select + or * function you will get three node, one with function name and two for arguments. Sililar like this picture: . Every function must define its argument in order to works correctly. Letter small o in the second rectangle means that the argument of function sin is not defined yet. To define argument select node with left mouse click, enter the name of the argument, and click on Add Param button. Whole process is depicted on picture below. With Delete button you can delete nodes. In fact you can delete only leaf node. If you have bunch of nodes, and want to delete node in the middle, you need to delete all leaf node below it, in order to delete it. So select the leaf node with mouse and click on Delete node button. After you finish the function definition, you must be sure that you defined all function nodes correctly with proper number of argument, otherwise GPdotNET will analise it and cannot pass further until you correct the function argument issue. Until next feature of GPdotNET vNext! I prefer write blog post about technical issue, and less about my personal life, but this time is not the case. After 1,5 year of working on master thesis, the final day is come. Offical oral defence will heppen tomorrow at 12th of May 2012 at Technical faculty in Bihać. Ceremony starts at 11:00 AM, so all of you are welcome on that event. Preferiram pisanje blog postova više tehničke prirode, a manje iz mog ličnog života. Međutim, ovaj blog post će biti izuzetak. Naime, nakon 1,5 godišnjeg rada na magistarskom radu, finalni dan je stigao. Sutra 12. Maja 2012 godine, s početkom u 11:00 sati će se održati odbrana magistarskog rada pred komisijom. Ovaj događaj je javan te stoga je svako dobro došao na odbranu. When you work with WPF, you can easily print visual content in to image by using RenderTargetBitmap and call render with WPF visual content. But there are some problems when you want to print the content which currently not showed on screen. For example if you want to print all Tab pages, you will have a problem because your content has to be showed on the screen before using Render method. 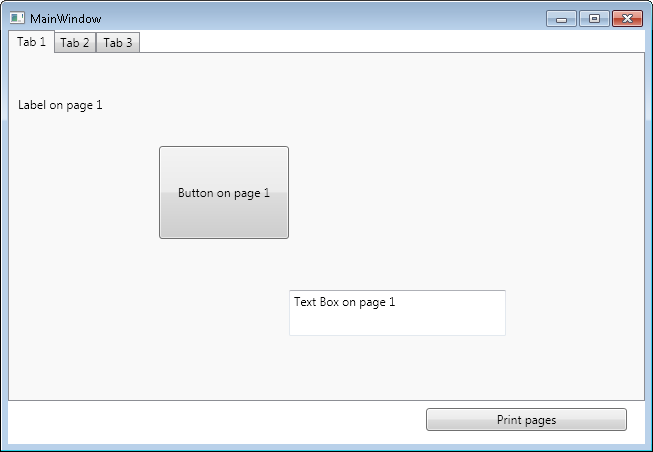 In this blog post it will be implement demo sample how to print all tab pages in to PNG image format. The idea behind this implementation was that during switching between tabpage, create background thread wait some millisecond, back to UI thread and Render visuals in to image, then proceed to next tab page with same steps. All said can be described in the following source code sample. In the previous method we have created three background thread waited some time to alow main thread to render content, back to UI thread and render visual elements. The result of caling prevous method is the following image files on C:/Temp directory. The whole demo sample with source code can be found here.